Customer install photos for the production version here. NOTE: These are currently only available through Little House Customs. We hope to make them widely available again in early 2018. We have had trouble getting some small things done with repeatable quality. (small welds and grinding) Because we work closely with Larry it is easy for him to catch and reject the bad one in a batch. We don't want to risk sending these to customers accidentally. Because these issues are minor, we have high hopes to get this product back in the regular flow soon. 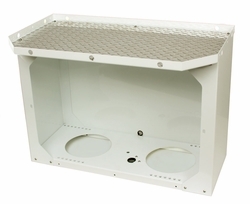 The Universal Over-tank Utility Platform gives owners the opportunity to maximize front end storage space. Use the built in holes on the top rail to tie down supplies, water cans, fuel cans, or generators. The platform top plate is made of diamond plate aluminum which helps to stop items from sliding around. Frame under the top is pre-drilled for Honda EU2000i & EU3000iS and Yamaha EF2000iS LowPro LockDown base plates. It is strong enough to support the Honda 3000 generator on our LowPro LockDown system. The standard 20 pound propane tanks can be easily changed out through the open front. The valve can also be reached from the front. The base unit comes with no back or front panels. An optional upgrade can be purchased to add a sliding front door and fixed back panel.This will be a simple bolt-on upgrade that can be ordered later if desired. Scroll down to add this option - or just the front door - or just the back panel. The platform comes with 4 grade 8 bolts for attaching to the top web of your frame through 4 holes you will drill. Or for a small upgrade we can supply 4 long u-bolts to allow you to attach without drilling. See below to order. Holes in the platform base are pre-drilled for the expected mount points. Note for customers that have fitted our jack relocation plate: The platform will definitely NOT work if you have relocated an electric jack, due to the height of the jack.It will work with a relocated manual jack. Except for the aluminum diamond plate top, and powder coated aluminum back panel, everything is White powder coated steel. All stainless-steel hardware is supplied. The platform comes as a flat-pack (to save you shipping) and assembly is required. The top is just under 32 inches wide by 17 inches deep (minus the front corners). It weighs about 43 pounds with the diamond plate top. Adding the aluminum door,steel door runners and aluminum back panel brings it to about 55 pounds. IMPORTANT: Owners who already have a weight distribution hitch installed may have interference issues. If you have a weight distribution hitch installed, please contact us prior to purchasing the platform. Note however that we have installed one over a Reese WDH by spacing it off the frame with the 1.25" spacers. Sway bars that do not protrude above frame height are OK. Some older Casita trailers have propane tank supports welded closer to the body. If your Casita is older than 2008, please check out our 'frequently asked questions' page which describes how you can measure to be sure before ordering. Or now you can just cut those unneeded supports off! It�s 32 inches wide and 12.5� deep at the base. The platform is 18 inches deep with its front corners angled to prevent any damage when backing sharply, although there is also an optional narrow top that�s the same width but is only 13.75� deep. The platform stands 23 inches tall overall but the height from the bottom to the platform floor is 21.9�. The opening is 27.7 inches wide by 18.7 inches tall. It accepts two of the standard 20 gallon propane tanks. It has its own floor, which allows you to move the mount point for tanks if you�d like. The top is finished off with an aluminum diamondplate/treadplate surface. The kit can be bought with or without the sliding door and rear panel, although it looks much nicer with them � and it keeps the squirrels and birds from building nests on your propane tanks. Q- What�s the purpose of the Propane Tank Platform? ANS- Almost every trailer, no matter the brand, has a pair of twenty pound propane tanks mounted on the tongue covered by a plastic cover. Undoubtedly you�ve seen them. The space for storage on every trailer is limited. Not only does the Propane Tank Platform provide an easily accessed propane tank storage area, but it offers a place to carry other things, or a worktop area, but more importantly, the top offers the perfect place for those who want to carry and store a generator for those times when an electric hookup isn�t available. It�s large enough for many of the �suitcase style� generators; the ones without the big tubing cage on the outside. The most popular are the Honda and Yamaha generators in the 2000 and 3000 watt range. We know because we also sell generator security systems nationally. They�re known as LowPro Lockdown, and from the national sales numbers it�s obvious that the Honda and Yamaha�s are by far the most popular. We also make the same, but taller version of the Propane Tank Platform for 30 pound propane tanks seen on some of the larger trailers. The only difference is that they�re six inches taller. Q � You mentioned portable generators, what models will fit on it? ANS � The Honda EU2000 and EU3000 models and the Yamaha EF2000 and EF2400, as well as the Champion 2000 watt models (listed under 4 engimatic numbers for the same basic generator) will all fit on it, as well as others. The 18 inch depth of the top will accommodate these models, as well as the LowPro Lockdown security systems for them. The narrow top option is capable of holding the Honda EU2000 and the Yamaha EF2000, but not the bigger generators. Q- Will the Propane Tank Platform fit most Casitas? ANS- Yes, so long as it�s the standard twenty pound PP tanks we�re talking about. The Propane Tank Platform has its own floor that the tanks sit in. The 1inch angle iron that creates the normal tank resting place in Casitas isn�t used at all. You can leave it in place or remove it. It doesn�t matter. The only pieces that may get in your way are the two small tabs sticking up that are welded on each side. Otherwise, the Propane Tank Platform is totally self-contained and can be mounted anywhere there�s space, no matter the brand of trailer. On a Casita, they weld a reinforcing piece of angle iron on the elevated coupler (hitch) platform that angles back and onto the frame. This limits the ability to move the platform around as much as you might like, however, by simply adding the 1.25� high spacers we sell, you can gain more maneuverability. Q - Will it fit most brands of trailers? ANS � Yes. There are considerable differences in the front A-frame of trailers but with the two versions of the depth of the tops we offer, most trailers can be accommodated. Q- What about weight distributing hitch equipment? Will it get in the way? ANS- If you have a weight distributing hitch that uses large attachments on the frame of your trailer, you simply need to use a set of optional spacer that will raise the Propane Tank Platform enough to clear the weight distributing equipment. We have 1.5� and three inch spacer sets. The 3 inch size will clear most any brand of weight distributing hitch. Q- How is it mounted onto the frame? ANS- There are two ways. You can bolt directly into the top flange of the frame, or completely through it, depending on your frame type � or, you can use the U-bolt package available. The U-bolt package contains four 5/16� square top U-bolts 7� long and special �� thick stainless steel clamp plates (the original clamp plates that come with them are too flimsy). We send the original 1/6� thick clamp plates along as potential spacers should you need to tilt the Propane Tank Platform slightly forward to clear any belly bands, such as on Casitas. We also have a new optional super-duper mount that allows people to clamp the Propane Platform to almost any trailer. Q- Do I need the front door and rear panel? ANS- Not unless you want them. Most people buy them, but it�s entirely up to the customer. My own Propane Tank Platform has the front door and rear cover, but we chose them because it�s more attractive, and because we had squirrels and birds building nests with each new season inside the PP tank valve guards when using the plastic tanks cover. Q- How secure is the lock on the door? ANS- Aaah! Good question. Let me explain the lock. The laws of many states require that propane tanks cannot be locked up so that they can�t be easily accessed, or that any escaping gas would be trapped, or so that it would prevent a fire being extinguished. In Texas, for example, the laws fall under several agencies, such as the Railroad Commission and the National Fire and Protection Agency (NFPA). For that reason, the cabinet is designed to breath. There are groups of vent holes positioned both high and low on both sides of the rear panel. More importantly, the door is made so that it�s entirely possible to defeat it, that is: to grab it and pull it outward enough at the mid-section to be able to then slide it open, despite the pin lock being extended into the lock position. However, to the viewer, it appears to be securely locked. Regardless, the tanks can breathe even better than under the original plastic cover and they�re more secure. The idea isn�t about locking the propane tanks up as much as it�s a convenient way to secure the door � yet it appears to the public that they�re locked away from access. Q- How much weight will the platform hold? ANS- More than a reasonable amount added to your tongue. They can easily hold 300 lbs. on the top. Q- Do I have to drill holes in the floor of the Propane Tank Platform to mount it. ANS- No! There are a series of holes positioned front and rear to mount it with. The front has 14 holes and the rear has 16 holes to accommodate the 50 degree angle of trailer frames. The support tubes that fit under the floor have matching holes. This insures that the Propane Tank Platform has plenty of support no matter your situation. Q- What colors are available? ANS- The cabinets are powder coated. Your choice is between white and white. Sorry. However, we can paint over the powder coat for a price. It�s expensive but it can be done. If we see enough demand for black we might offer it in the future. Q- Can gas cans be added to the sides? ANS- Yes they can. A company named RotoPAX makes gas cans and water cans that are mountable on the side panels � and lockable! Great product! They make them in various sizes. Check out RotoPax.com or Amazon for their products. Q- I see you make two sizes of tops. One is narrow. What�s the reason? ANS- Because the tongue configuration of some trailers limits the space between the Propane Tank Platform and the tongue jack. The narrow version is identical to the other except for the top. It�s 13.75� x 32� while the full size top is 18� x 32�. The cabinet itself is 12.5� deep by 32� wide by 23 inches tall. Q- Why the angled front corners on the full size top? ANS- It�s done to prevent any jackknifing against the top when backing up. Q- Can I mount a bicycle on the top of the platform? ANS- Yes you can, however, I�ve tried it and found that a bicycle extends out on each side more than I liked. Two bikes are next to impossible. Handlebars and pedals take more space than realized. It�s also harder to get them off and on the bike rack than my Thule T2 bike rack mounted on the trailer hitch on the rear. Did I mention that we sell trailer hitches for Casitas and Scamps? How about that for a plug? Q � If I want to mount a portable generator to power my trailer, do you have any suggestions? ANS � As mentioned previously, we can only tell you what we know due to our sales of LowPro Lockdown systems to secure generators. The EU 2000 and EU 3000 Hondas outsell Yamaha and Champion at a rate of about 50 to 1. We have yet to sell anything to contractors and the film lighting companies but the models for Hondas. They buy them in large quantities � but so far, only for Honda generators. Consists of 4 square zinc-plated u-bolts with stainless hardware and a thick stainless clamp-plate. They are long enough to fit up to a 4" deep by 2" wide frame. Casita frames are 3" deep by 1.5" wide. Consists of 4 square u-bolts with stainless hardware and a thick stainless steel clamp-plate. They are long enough to fit up to a 3" deep by 2" wide frame when used in conjunction with the 4 laser-cut,powder coated slotted spacers provided. Casita frames are 3" deep by 1.5" wide. Spacers allow the shelf to be fitted above 1.25 inch protrusions above frame height.